Glaro Inc. wet umbrella bags are designed with two elongated whole openings that are spaced approximately 3.25” on center. Each horizontally elongated slot is approx. ¾” long. While Glaro Inc. bags are designed to fit Glaro wet umbrella bag stands, they will also fit most other bag stands, depending on that brand’s umbrella stand design and how the bags mount onto that stand. Glaro Inc. stands have two convenient hooks that make the placement of bags onto the stands very easy. If the stand of another brand has hooks wider than ¾”, or other dimensions do not match the Glaro model, the bags may not fit. We recommend that you contact the Glaro customer service team if you have any further questions. Glaro Inc. recommends using products within a single product family to get the best performance and the most consistent appearance. 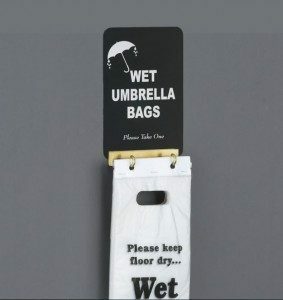 For more information on Glaro wet umbrella bag stands, visit: https://glaro.com/umbrella-stands/.